According to the University of California San Francisco Medical Center, most adults consume 20 times more salt than the body actually needs to function properly. The NAS, or no-added-salt diet, involves restricting sodium intake to less than 4 grams, or 4,000 milligrams per day. The NAS diet is usually prescribed to decrease water retention for people who have high blood pressure. 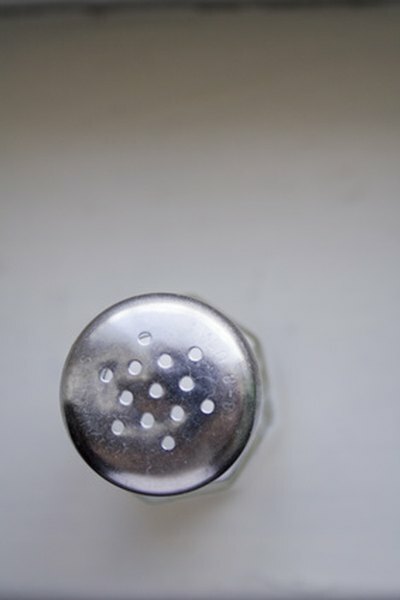 The main restriction of a no-added-salt diet is to avoid the saltshaker. You are not allowed to add salt during cooking or to meals before eating. It is also recommended that you read food labels and do not consume any foods that contain more than 250 to 300 milligrams of sodium per serving. When following a no-added-salt diet, most of your diet should consist of whole, fresh foods, like fruits and vegetables. While avoiding adding salt to foods can help significantly reduce your total sodium intake, you should also avoid foods that are high in sodium. Ham, bacon, deli meats and pickles are some of the most significant sources of sodium in the diet. Avoid hot dogs, pepperoni, bologna, olives, soy sauce and relish. Cheese, especially American cheese or processed cheeses, is also high in sodium. Canned soups and frozen meals are usually very high in sodium because manufacturers add salt to maintain freshness and increase shelf life. In addition to paying attention to the amount of sodium per serving that a packaged food contains, it is also important to check ingredient lists for ingredients that indicate extra sodium. You should avoid foods that contain the words salt, sodium chloride, monosodium glutamate or MSG, cured, pickled, brine and smoked. When choosing snack foods, such as pretzels, nuts, popcorn and potato chips, always opt for unsalted versions. If you do not have access to fresh vegetables and have to use canned or frozen varieties, rinse the vegetables before cooking. Rinsing can remove some of the added salt and decrease the sodium content of the vegetables. Many popular foods, such as canned soups and frozen entrees, as well as cooking ingredients, such as chicken broth, come in low-sodium or sodium-free varieties. Always look for low-sodium versions of any foods that you buy. Eating most of your meals at home can help you control the amount of salt you consume as well, since many restaurants add a lot of salt during cooking.